Don’t worry I will give you the real approach to these advertisement networks, as well as I will tell you which one is better in which conditions. If you are looking for only visitors to your website then it is good but for selling products ROI (Return of Investment) is not good. If you are getting traffic from US, Canada then you are going to get paid much more than Asian countries of course your CTR will not get down. See, if you want to earn money from blogging then you have to have few things although those habits or I must say such type of etiquette is pretty common among bloggers, if you wanted to become successful blogger you must have such type of etiquette. See, I have been blogging from last five years and today I can understand the value of blogging, because its really worth. If you have not started yet, then start blogging today because may be today or tomorrow there would be number of bloggers going to have their blog may be you will also have, because it is really a big asset in the internet world, then why not to start today. See every advertisement networks share their revenues with their publishers that’s true, here both advertisement networks are good, if you are thinking to monetize your blog then I have very good tips for you, try both networks for one week only. See, which network let you earn more, then go with that advertisement network, one more tip I could like to share with you, if you want to earn more from your blog then try affiliate marketing with advertisement networks. 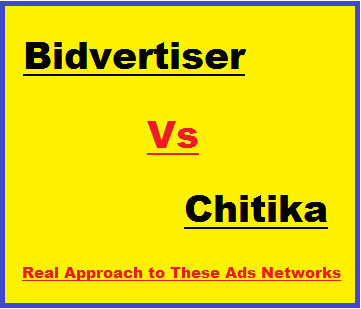 nice post clarifying all doubts of both the ad networks Bidvertiser and Chitika. Glad it helps you thanks for your continuous feedback if you need any help let me know?